2008: A Norwich Christian couple, who have helped to create what is believed to be the largest youth group in the city, are to move to South Africa to help launch a new Hillsong Church in Cape Town. Jon (29) and Chantel Norman (26) have spent the last four and a half years at the Norwich Family Life Church (formerly Mount Zion) working with the church’s Wildlife youth project, which now attracts around 150 youngsters every week. Jon, who was born in Norwich, spent three years in Sydney, Australia, at the Hillsong College. Hillsong is a church of 21,000 people and is known world-wide for its worship music. He said: “Wildlife has built from 20 kids in 2003 to around 150 each week. I hope I have helped redefine youth culture in Norwich, giving young people an alternative to street hanging, binge drinking and ultimately to find God. Wildlife will continue to move forward under the amazing leadership of Tim and Sarah Lee every Friday night. “The last four and half years of our lives have been a truly amazing journey. It is hard to put into words all that God has done. “Over the past few months God has really stirred us to follow the dreams which he has placed within our hearts. In order to pursue the purpose that we believe God has for our lives, often he takes us away from comfort, our family and friendships. Cape Town will be only the fourth church plant worldwide for Hillsong, following churches in London, Kiev and Paris and the senior pastors will be Phil and Lucinda Dooley. Phil has overseen the well-known Hillsong United team for the last 10 years. In Cape Town, Jon will be heavily involved with the youth work and Chantel with the worship. They are set to leave Norwich on May 6. 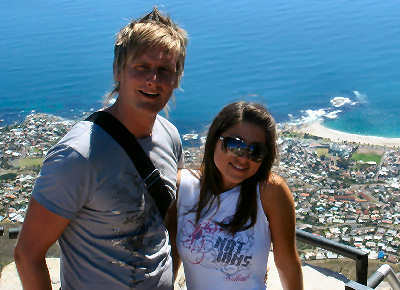 Pictured above are Jon and Chantel Norman standing on top of Table Mountain in Cape Town. Although our encounters have been brief, I sensed that you were a man of God, always seeking His Way for your life and ready to serve Him in whatever way He wanted you too. Cape Town will be the richer and Norwich the poorer with your departure. You will both be in my prayers. Please keep us us updated. I excited for you, and for the blessing and hope you will bring to the youth in CT. Many blessings to the both of you! I Represent a missionary team based in Bergvliet Cape Town called Youth In Worship. We want to host a contest for youths called BATTLE OF THE BANDS. Would the Hillsongs Worship team be interested in being a guest at this event?